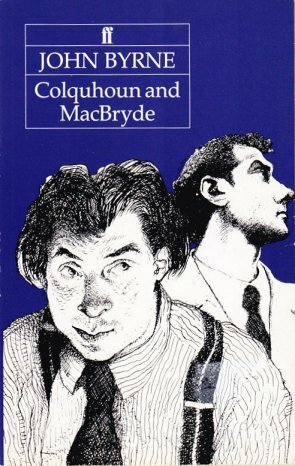 Colquhoun and MacBryde are sometimes seen as at a bit of a tangent to the ‘A’ List of British modernism, down a cul-de-sac. This view is shaped by the wisdom of canonics narrowed by hindsight. In fact, it would have been extraordinary if such (for a while) celebrated and successful painters had not exerted their influence on others. Which they did. 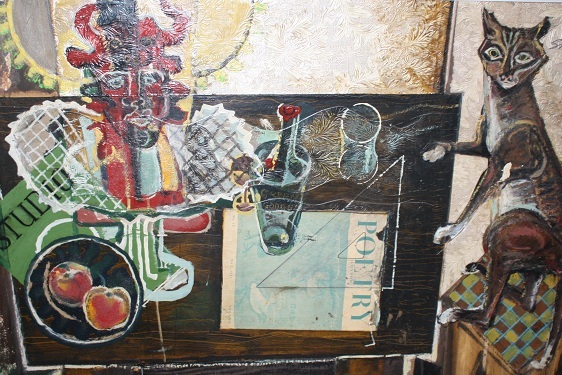 We are in debt to the excellent finbofinbo blog for rescuing and making available some excellent primary material on the Stoke painters John Shelton and Arthur Berry, both of whom knew the Roberts at Bedford Gardens in 1945, during a spell of roving in Fitzrovia. No point in retailing it all here – go there and explore! The influence of the Roberts on Berry (unfairly labelled “The Lowry of the Potteries”) is relatively diffuse, but would be well worth looking at. Their influence on the earlier period of Shelton’s work is much more direct. 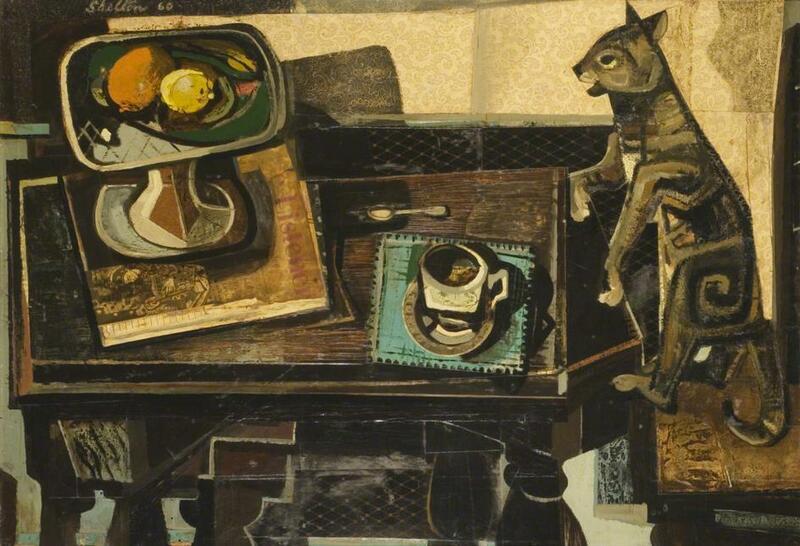 A striking example is the cat in Shelton’s undated Cat and Table 2 with Theseus Head, which appears to have leapt straight out of Robert Colquhoun’s 1946 The Whistle Seller, while its version in his 1960 Cat on a Table is very closely related. By 1960 Shelton’s pub crawling days with the Roberts were long gone, but the impact of their work on his was clearly still active. Further consideration of those influenced by the Roberts brings us to David Carr, heir to the Peek Frean’s biscuit business and a rather patrician figure, best known as an enthusiast and collector but in fact a committed painter, though virtually in secret. 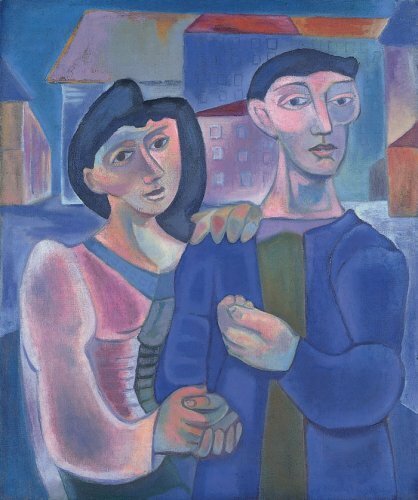 Carr died in 1968, but his work, hardly ever exhibited in his lifetime, lay dormant until its “rediscovery” in 1987 by the Mayor Gallery – the occasion for the single book on him, well illustrated and still available for a modest price. 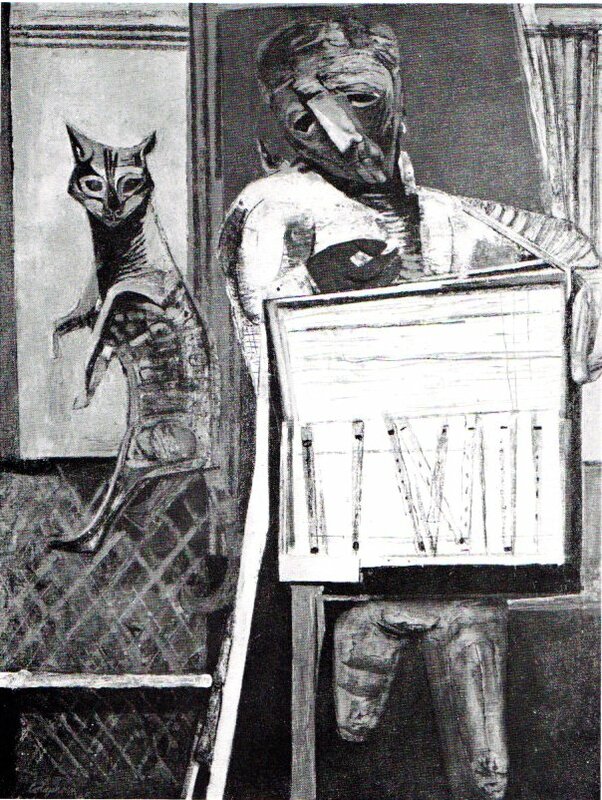 From this point onwards, Carr’s Man and Machine series of the ‘fifties progressively conflates bodies and machinery in fractured post-cubist planes – not always successfully (he is too fond of dislocating and patternising his tonal planes by outlining them in black), but always interestingly. And he was a great colourist. 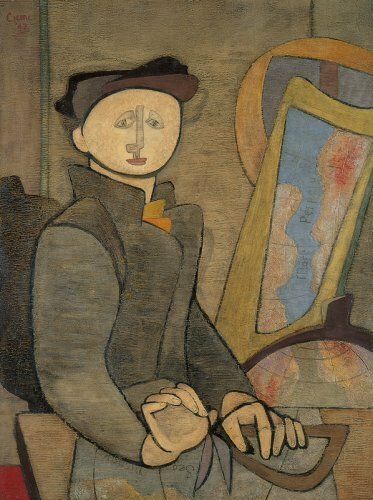 The influence During the opening years of the war Carr was a student at Cedric Morris’s East Anglian School of Art, alongside the young Lucian Freud. His earliest paintings combine the chunky plasticity of Morris with the deadpan naivety of the young Freud, while the drawings of that period share Freud’s obsessively linearity. 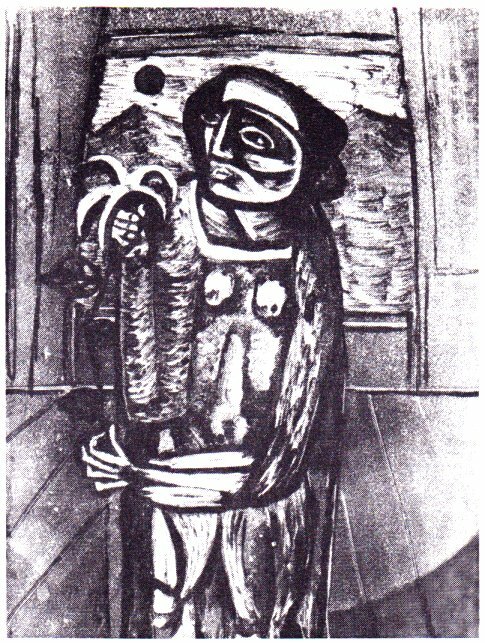 Figure with Skull of 1947 is typical enough. (Incidentally, am I the only person who considers that Freud’s work was seduced from its true, meticulous calling circa 1954 when hijacked by the fully loaded expressionist painterliness of Bacon, Auerbach etc?) Shortly after, Carr rediscovered the family biscuit factory as a rich source of imagery, and began a prolonged exploration of the relationship between worker and machine, a theme he shared with his friend the painter Prunella Clough. 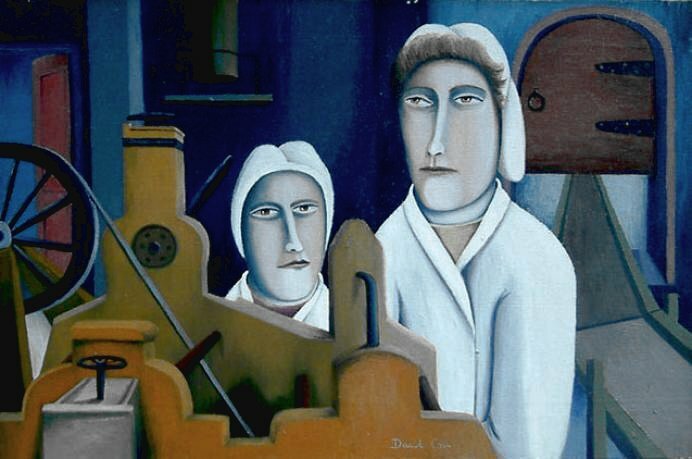 An early result, in the deadpan style, is Biscuit-factory Workers of 1949, but a dramatic leap forward is visible in Dough Mixer of the following year, in which the Colquhoun-MacBryde semi-abstracted look is now very evident in the shadowed figure. Another very worthwhile but rather neglected artist who collided with the two Roberts was the English painter of Russian Jewish ancestry, John Kashdan, who died in 2001. (Biographies can be found here, here, here and here.) 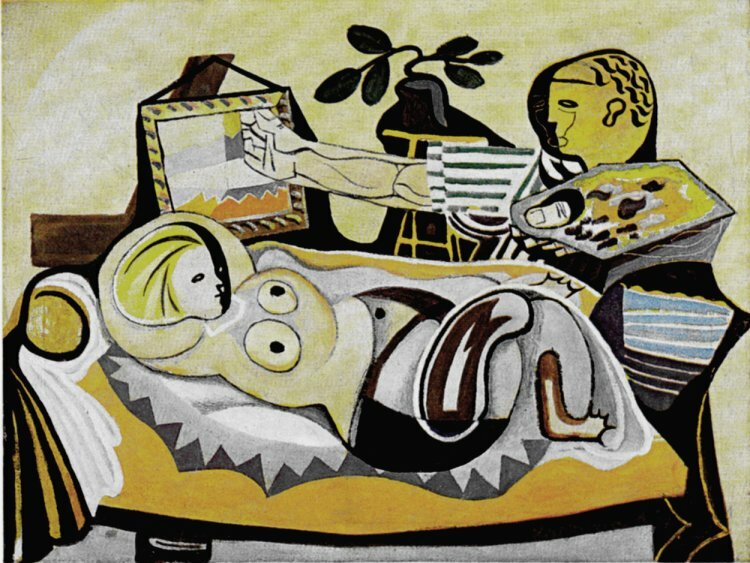 In the early ‘forties he was close to Henry Moore and to the dealer Gustav Kahnweiler, and the work of his earlier period appears to have been heavily influenced by Picasso, Braque and Gris – lolling nudes, all rather mellow and Meditteranean. 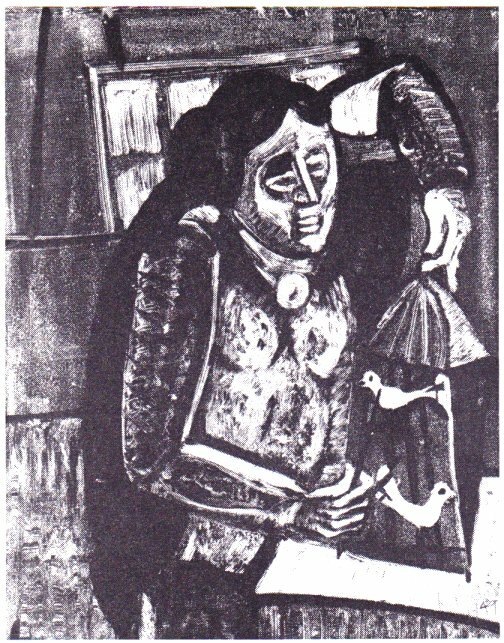 Then three things seem to have happened: the War, whose impact gave his work much more of a tragic and humanitarian edge; his mastery of the monotype process, which gave it a distinctive textural intensity, and his encounter with the work of the Roberts, Colquhoun in particular, with which it now shared a certain poetic vision and, sometimes, a characteristic look. 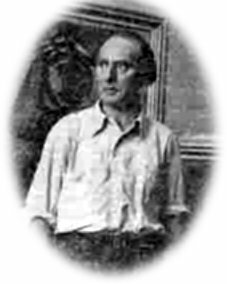 Around 1950 he withdrew from exhibiting and focused on his teaching, but his career took a setback in 1968 when, with many other staff, he was sacked from Guildford School of Art for having been too sympathetic to the radical aims of the student body during their occupation of the college. 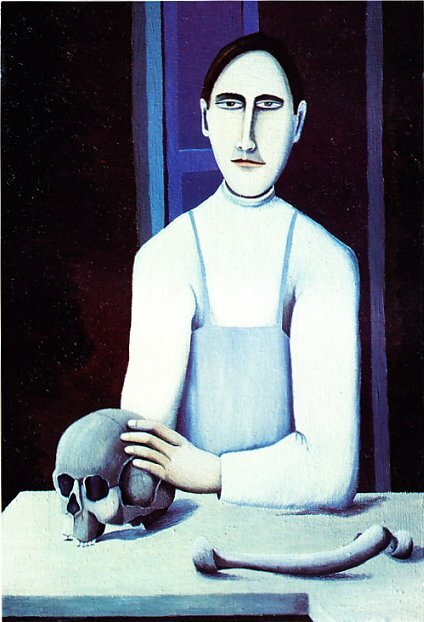 After his retirement, his work was exhibited twice by the England & Co Gallery, London. 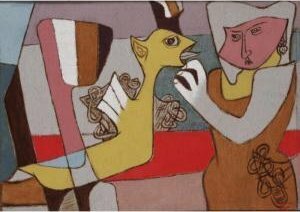 To characterise Kashdan simply as a follower of the Roberts would be unjust, for there was two-way traffic, and his use of monotypes was a particular stimulus to Colquhoun. 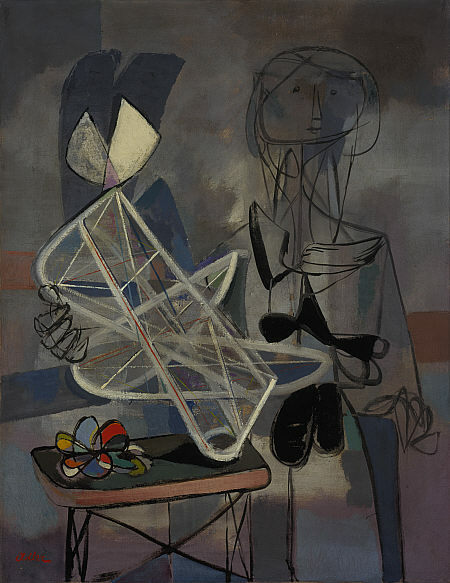 Kashdan had picked up this technique before the war from Richard Ziegler, who had supposedly learnt it from Paul Klee. Ziegler and Klee had also used a “transfer” or “offset” drawing technique – drawing on the back of an inked sheet of paper onto a second sheet. Kashdan sometimes drew directly onto the back of paper laid on a sheet of inked glass. (Warhol later employed a version of these processes to obtain his characteristic “blotted line” look.) Kashdan also often coloured his monotypes with watercolour or gouache. A number are in the British Museum collection (sadly, no images with the online database). 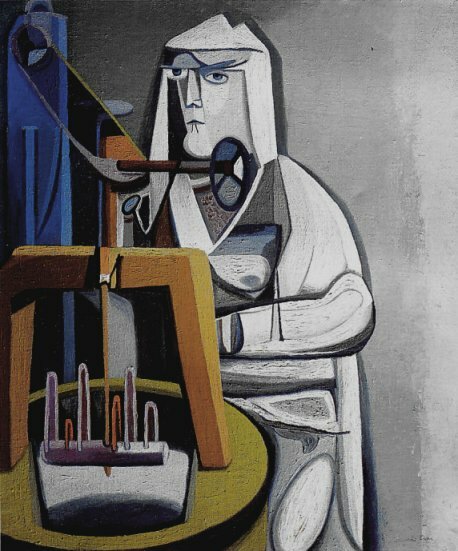 Colquhoun, in particular, used the process extensively for the rest of his career, and Kashdan’s work, conversely, benefited from the examples of Adler and the Roberts, sometimes employing the Roberts’ formula of a lone figure, sometimes anguished, with an animal or object, rendered in post-cubist flattened planes. 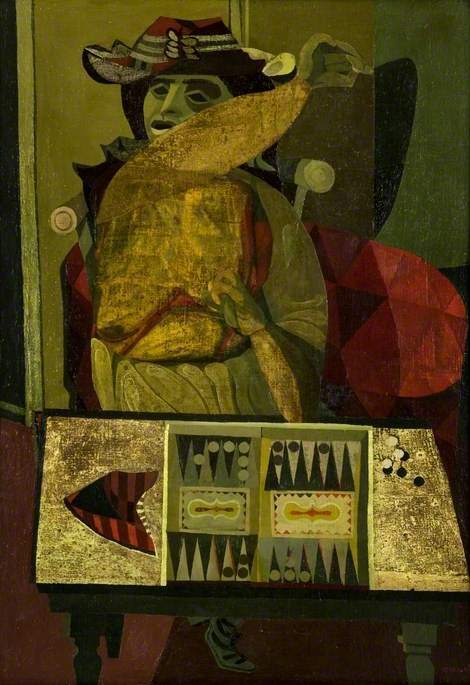 The 1946 oil Butterfly Catcher, for example, shares much of the Roberts’ style and colouration, though it could not really be mistaken for a Colquhoun. There are other influences – Klee, Cecil Collins, Posada – but for a decade or so, from the mid-forties, there was a recognisable overlap in the work of Kashdan and the Roberts. It makes sense to see the Roberts and their mentor Adler at the core of a particular strand of British post-war figurative painters whose work was in many ways distinct from that of other “neo-romantics” with whom they are sometimes bracketed. This strand might have accumulated real force, identity and direction had it not been eclipsed by the cold war colonialism of American abstraction and its European derivatives. But in an earlier incarnation Benjamin Creme was a young Scottish painter, and a rather fine one too. 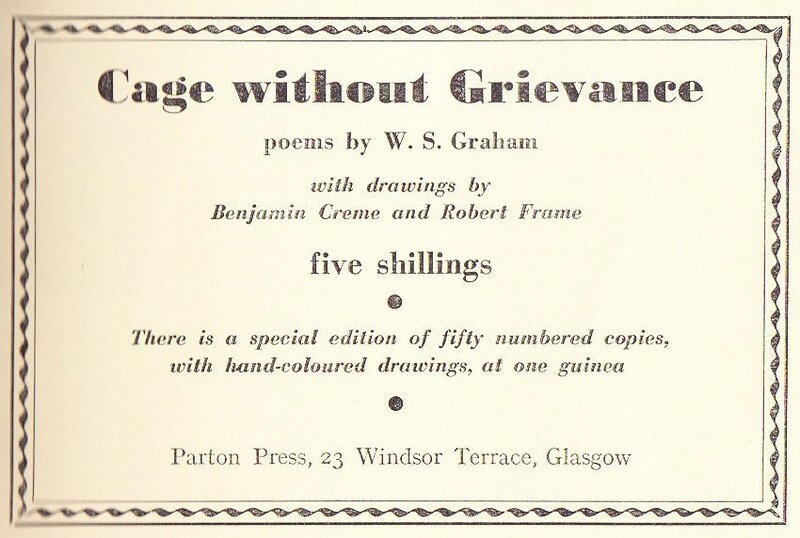 During the war years, he was part of the Jankel Adler and Two Roberts circle, and in 1942, with Robert Frame, had the distinction of illustrating W S Graham’s first collection of poems, Cage without Grievance, published by David Archer’s Parton Press in Glasgow. Later he turned to landscape, and later still to Theosophy and the writings of Alice A Bailey (also a prime influence in the late stage careers of bonkers British painters Pailthorpe and Mednikoff). 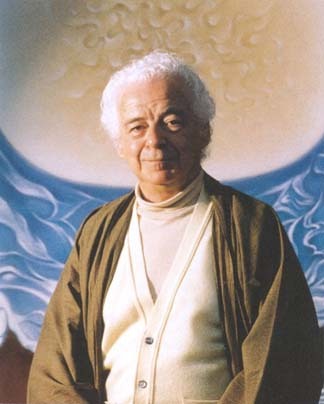 In the ‘seventies he began channelling messages about the Maitreya, and since then his painting has been given over to rather bland, simplified abstractions of spiritual significance, in the manner of mandalas. His earlier work is still handled by the England & Co Gallery, London. There is a handy guide here, among the esoterica, to publications related to Creme’s art. 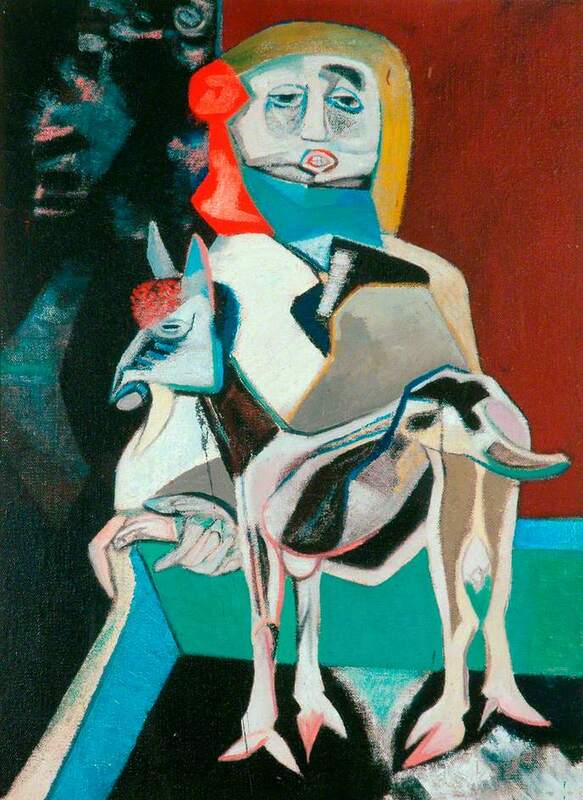 Creme’s paintings of the ‘forties often feature lone figures, very much in the style of Colquhoun and MacBryde, though with a more obvious debt to Picasso. They show a fondness for simplification, flattened colour and understated texture that perhaps anticipates the much later mandalas. He was an accomplished colourist and used oils with confidence, though his drawings and watercolours of this period are often less certain. 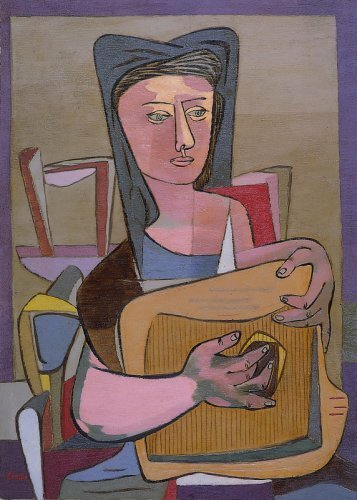 In the later ‘forties some pieces look a little more hurried, but Girl with Zither and Sea Discoverer of 1942, for example, are entirely stately and harmonious. 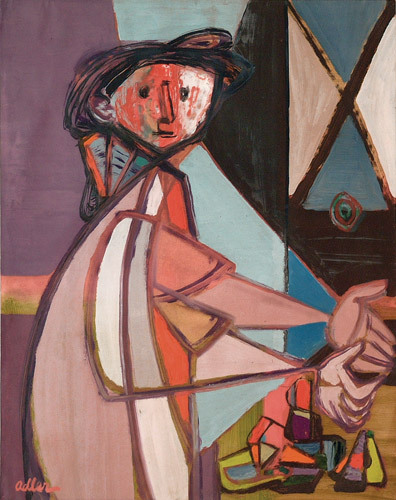 The deft and eloquent hand gestures seem to anticipate those in Colquhoun’s paintings of 1946 and thereabouts; in some respects the Roberts may have borrowed from Creme, and it would be too simple to define him as merely their imitator. His paintings lack the rich, textured luminosity and depth of Colquhoun’s, and therefore their dark pathos and poetic vision, but in other respects they parallel the Roberts in a number of ways. They make a very pleasing contribution to the movement of which the Roberts were the most celebrated expression. Incidentally, what happened to the work of Creme’s 1942 collaborator, Robert Frame? Assuming that he did not reinvent himself as the Californian landscape painter of the same name, why has he become invisible? 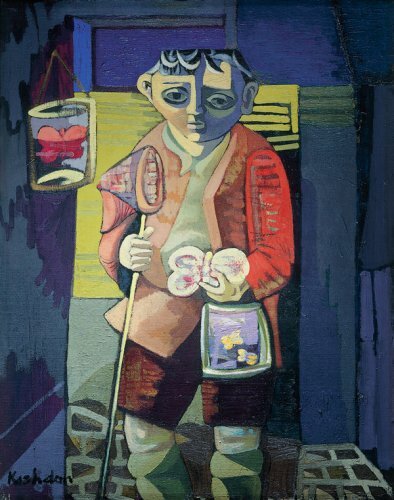 His “Tinker period” paintings, from 1945, feature travelling people comparable to the peasants and beggars of Colquhoun and MacBryde, who represent the fragility of the human condition. 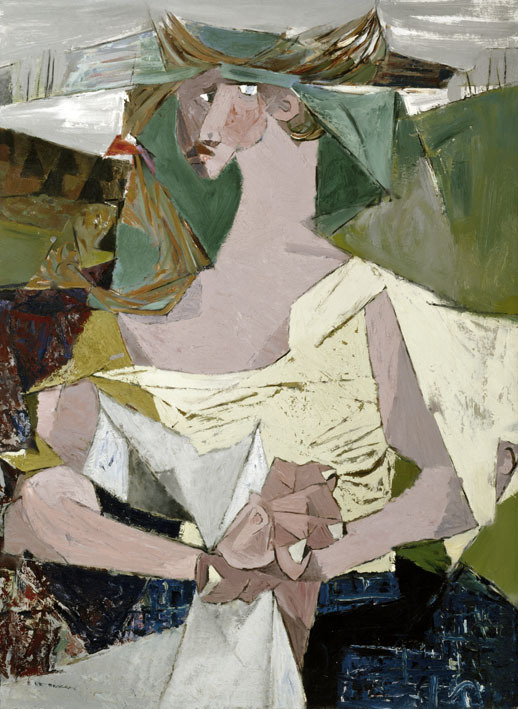 (Tinker Woman with Newspaper of 1947-8 is plausibly credited with sparking off De Kooning’s series of semi-abstracted women.) Accumulating the generalised anxiety of the times, these images developed into something of an “apocalyptic” theme. 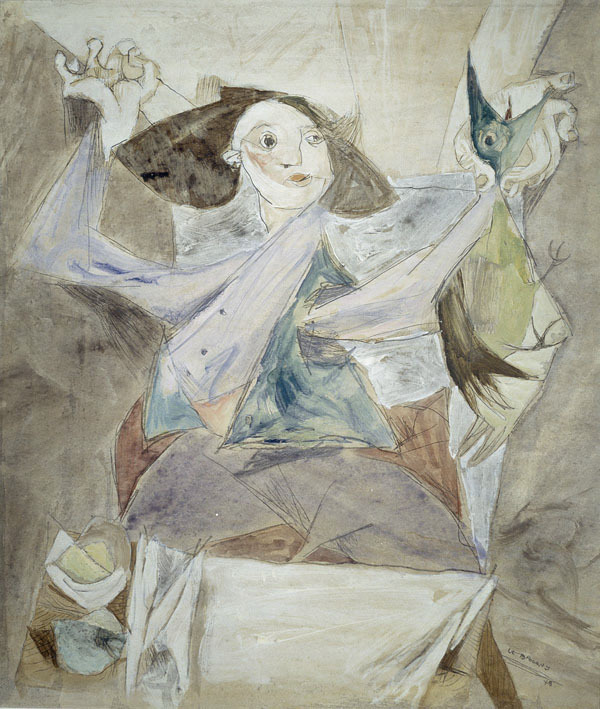 Constructed in flattened triangles of loose, expressionist paint, le Brocquy’s tinkers possess a distinctive shadowless twitchiness, but show particular points of convergence with the Roberts; hands, for example, are sometimes mannered and massively fingered in a style reminiscent of Adler, Colquhoun or MacBryde – compare the study for Man Creating Bird (1948) with MacBryde’s 1947 Backgammon Player – while Goat in Snow of 1950 is clearly related to some members of Colquhoun’s menagerie. 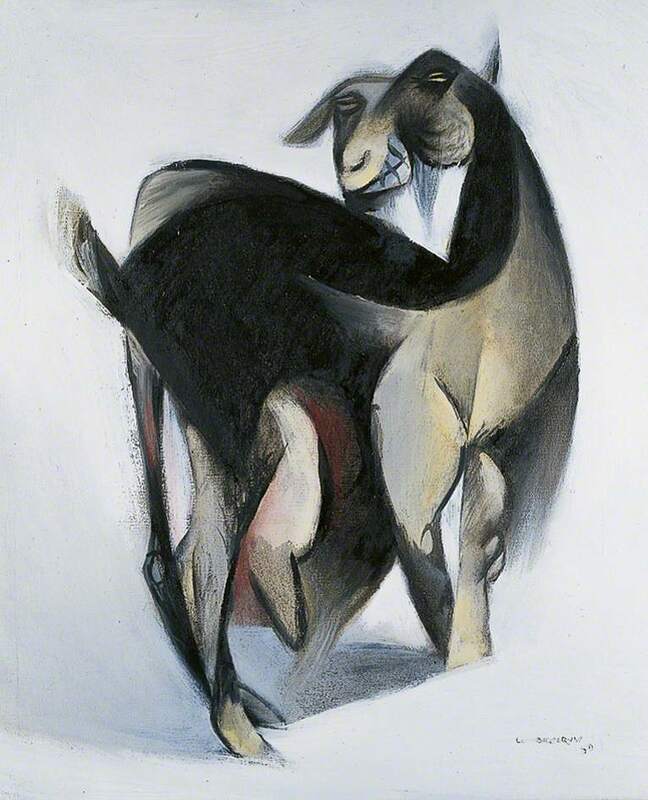 A “grey period” of 1950 reverted to the Picassoesque; after that le Brocquy went through numerous transitions, initially flirting with Bacon but always moving towards increased flimsiness and superficiality, though rendered with increasing technical finesse. The culmination of this trend was perhaps a late portrait of that great Irishman, Bono. But never mind. 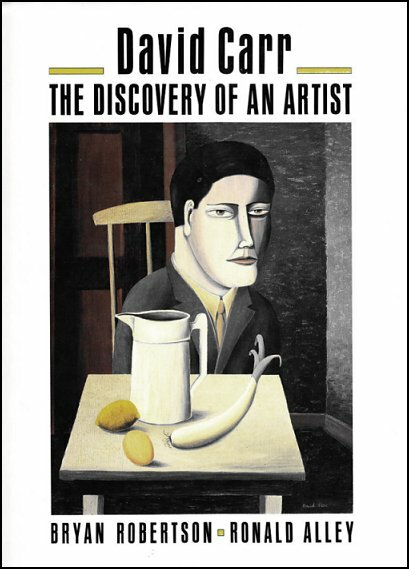 The earlier stuff is edgy and masterful, and fits well within the post-war school headed up by the Roberts – internationalist in outlook, post-cubist in style and primarily concerned with the humanity of the human figure. We can see now that this was neither Celtic fringe nor an easy Picasso-ism, but a definite “look” within a movement that had clearly diverged from the Palmer-based neo-romanticism of Craxton, early Minton etc. 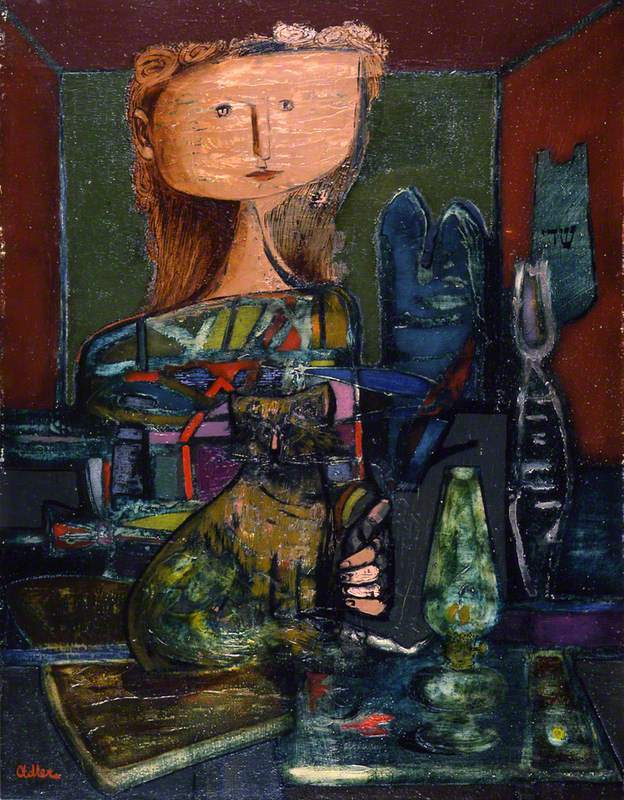 The exiled Polish painter Jankel Adler is counted as a major influence on the Two Roberts. He had a long and distinguished career in Poland and Germany before winding up in Scotland in 1941, invalided out of the Polish army. In Glasgow he knew the Roberts as part of David Archer’s circle, before moving in 1943 to London where he took the studio above theirs in Bedford Gardens. He died of a heart attack in 1949 at the age of 54. I don’t know enough about Adler to be able to say much sensible here, but one or two things occur. But was it as simple as that? 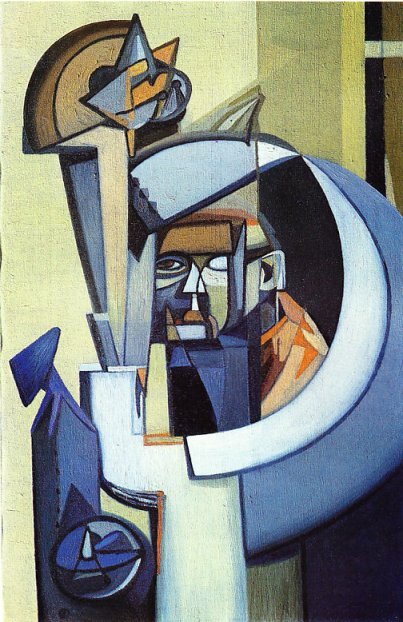 Adler’s work underwent a series of transformations over the years, and his style at this time is not necessarily continuous with his previous work. How much mutual influence was there? Do Adler’s lone figures with animals or tables pre-figure those of the Roberts, or evolve in parallel with them? His The Mutilated of 1942-3 is generally reckoned to anticipate Colquhoun’s beggars and tinkers. Adler’s luminous and sumptuous colouration was certainly influential. 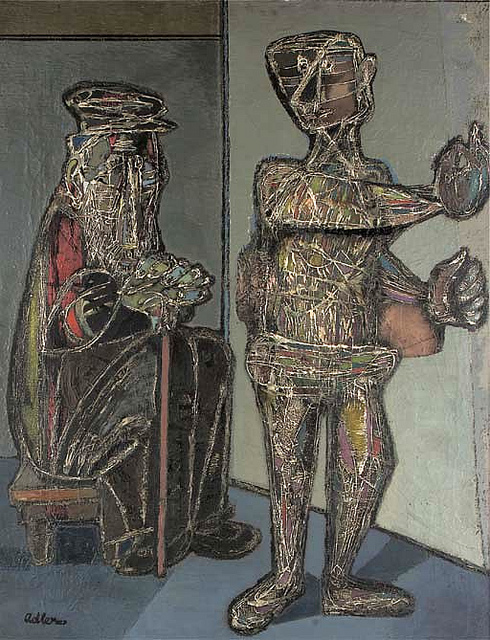 Though his figures are sometimes more extenuated and casually Picassoeque, less rooted in observation, and he often builds them fortuitously on looping linear abstractions like bundles of wire, leaving underlying textures isolated and visible within the boundaries of the figure but blocking out the surrounding “background” in the top layer. These linear constructions are sometimes in white paint on a darker ground, but sometimes scraped through the wet painted surface. Their form owes much to the work of etching maestro S W Hayter, with whom Adler had collaborated in Paris. 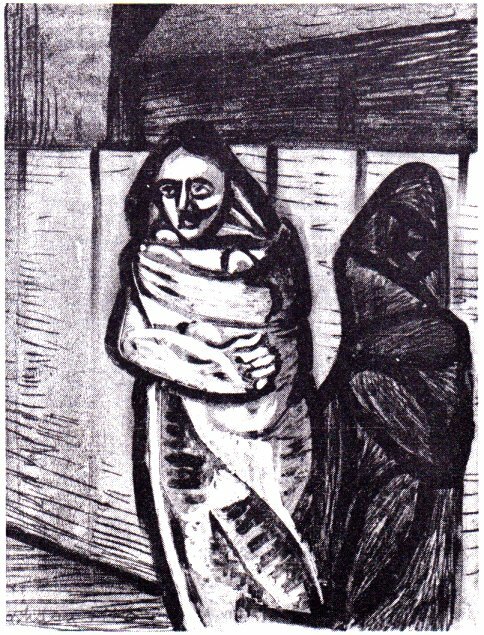 The scraping of lines is analogous to the scratching of lines through a ground in an etching; in fact much of Adler’s approach to painting at this time, involving scratching, layering, lifting and revealing, seems to be derived from Hayter’s experimental approach to that medium, where surfaces are not accumulated but cut into and interfered with. Anyway, here are a few Adlers I like. A great pity that he died so early. Woman with a Cat and The Poet, to name just two, are stonking pieces of painting. From Potts’ Dante Called You Beatrice, 1960. There aren’t too many reminiscences of Adler during his time in Britain, and this is a good one. If there is any such word as semitophile, Potts was such; he went out to fight with the Israeli army in the 1948 war of independence. Sheila Fell, about whose talent he wrote warmly elsewhere, was the accomplished and painterly landscape artist who died in 1979. The aristocratic Margaret Gonly was a friend of Potts. 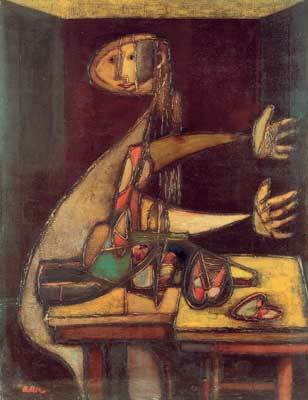 The whole lovely thing about the Jewish world was contained in the person of Jankel Adler. Quite apart from hating bullies, I have come to love the Jews very deeply. They possess that mixture of idealism and common sense, of generosity while being practical, that bit of both, which is so much a part of true living. 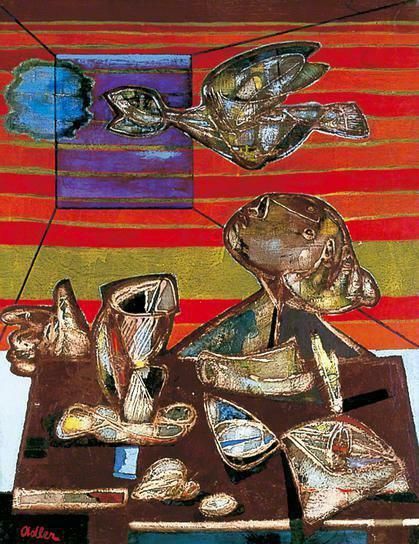 Like most real artists, Jankel Adler, though a very complex painter was a very simple person. Not only was he solitary he was very lonely too. His whole world had been killed in a gas chamber. The centuries-old history of Eastern European Jewry had come to a stop and to what an unimaginable end. Has ever a culture been destroyed so unnecessarily? 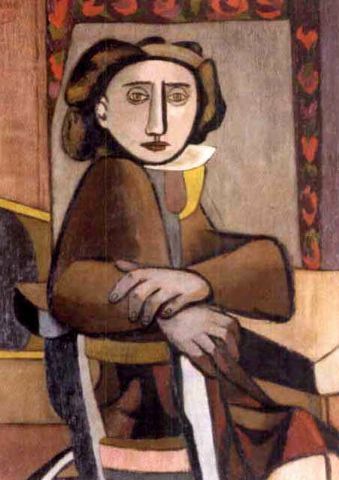 If ever a person died of loneliness, his name was Jankel Adler. There is a huge difference between being solitary and being lonely. All real artists are solitary. The only one I ever met that always went around in a gang was George Barker. This applies also to women. Both the women l have loved were very solitary people indeed. So too were Sheila Fell and Margaret Gonly. There is always something horrible about people who don’t like Jews. They are in a very special manner the conscience of mankind. Hatred of Jews is really self hatred. Orwell used always to say that everyone had some anti-semitism in them and the thing to do is to take it out and let the air of reason reduce it considerably. But I just don’t believe this. I’ve had ﬁerce rows with several Jewish people in my time, but never for one instant did I have the slightest anti-semitic feeling about them. The row was quite personal. 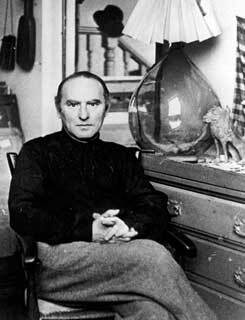 Jankel Adler was the most Jewish person I have known. He was so Jewish, he almost painted in Yiddish. He wasn’t Hebrew at all, he had forgotten Jerusalem, but he remembered the Ghetto. He was indeed a King of a man. His work was never fully appreciated in England, a country which likes its painters to remain literary. The English genius is so steeped in literature, that it overﬂows into English painting and music, to their detriment. His only real friends among British painters were Colquhoun and MacBride. He must in any adequate reckoning be considered a minor European Master. His life, he died suddenly in his middle ﬁfties, is a miniature history of European Jewry. Born in Poland, a country he never ceased to love, despite the fact that it was almost as cruel to artists as it was to Jews. He went to Germany as a young man and then to France. He ﬁrst became famous in pre-Hitler Germany. Was a friend of Paul Klee. He arrived in Scotland, as a private soldier in that section of the army of Poland, recruited in France. He died in 1949 his work unﬁnished. He was a true European, a real liberal. Behaved like a bishop, thought like an anarchist. On my leaving to begin my journey to Jerusalem, he gave me a painting, one of his smaller ones, his small ones were his best. Having no wall on which to hang it, I asked if I might leave it in his studio. When he died, it was too complicated to claim it. The thought was in fact as good as the deed. He loved entertaining his friends, spending a long time getting dressed, telling stories and taking girls to dinner, buying large quantities of cigarettes and sitting in expensive seats in a cinema. He was something that England in this century has never produced (although Scotland has) – a real artist who was also a real socialist. He was very kind and terribly generous, also awfully mysterious. To hear him speak English was a poem in itself. Like his ties, it was so original one forgot it was real. He was rather shabbily treated by the English Art world. After all, he was a very distinguished exile indeed. One famous national weekly never managed even to spell his name correctly. Yet, when the war was won, he preferred to remain with us rather than return to France. He died in the middle of his work. His breeding went back to Jerusalem, his reputation as an artist will increase with the years. Enjoyed it, very much needed in this present day & age of the celebrity, empty soulless artist.